Draft: 2009, Washington Nationals, 12th rd. Married, wife's name is Jenny...Graduated from James Martin (TX) HS...Played one season collegiately at North Carolina State University, before transferring to Texas Tech for his final two seasons...Originally drafted by the Houston Astros in the 10th round of the 2006 First-Year Player Draft (did not sign)...Selected by the Washington Nationals in the 12th round of the 2009 First-Year Player Draft...Signed by Bob Laurie. Spent the entire season on the Kansas City Royals disabled list (right elbow inflammation); placed on the 10-day DL on 3/29 and transferred to the 60-day DL on 6/2...Made four starts in Spring Training for the Royals, pitching to a 1.98 ERA (3 ER/13.2 IP). Made eight starts (nine appearances) in his first season with Kansas City…placed on the disabled list May 24 with nerve irritation in his right arm and missed the remainder of the season...underwent successful surgery on July 19 ... Went 2-2 with a 4.17 ERA (21 ER in 45.1 IP), collecting 51 strikeouts…held opponents to a .237 average (41-for-173) ... At the time of his injury, he ranked seventh in the American League in strikeout rate (10.13 K/9), among hurlers that had worked at least 45.0 innings ... Posted a 1.59 ERA (3 ER in 17.0 IP) and held opponents to a .159 average (10-for-63) at Kauffman Stadium, compared to a 5.72 ERA (18 ER in 28.1 IP) and a .282 average on the road ... After going 0-2 with a 6.26 ERA (16 ER in 23.0 IP) in his five April appearances (four starts), went 2-0 with a 2.01 ERA (5 ER in 22.1 IP) in four starts in May prior to the injury ... Struggled in the first inning, allowing five runs in his eight starts (5.63 ERA)…he had a 3.96 ERA (16 ER in 36.1 IP) from the second inning through the sixth in his starts ... Earned his first win in a Royals uniform on May 3, 6-1 over the White Sox…allowed one hit and one walk over 6.0 shutout innings…snapped a streak of 12-straight winless appearances (four starts) ... Struck out a career-best 12 hitters in his May 13 start vs. the Orioles…became the first Royals pitcher to collect 12 K's or more in 5.0 innings or less and the first in the Majors to do it since the Cubs' Jake Arietta on June 5, 2016 vs. Arizona ... Also recorded 10 strikeouts in his May 8 start at Tampa Bay, becoming the sixth KC hurler to reach double-digits in K's in consecutive outings and first since the late Yordano Ventura (Aug. 27-Sept. 2, 2015). Posted a 6-2 record with a 5.15 ERA (54 ER in 94.1 IP) with 101 strikeouts, before missing the final two months of the season...Placed on the 15-day disabled list with a lower back strain on July 30…transferred to the 60-day DL on Sept. 1...Had a 4.56 ERA (41 ER in 81.0 IP) as a starter; posted an 8.78 ERA (13 ER in 13.1 IP) in seven relief appearances...Over his first 10 starts (April 9-May 30), went 5-1 with a 3.43 ERA (22 ER in 57.2 IP) with 57 strikeouts… had a 7.33 ERA (19 ER in 23.1 IP) over his final five starts, before being moved to the bullpen...Set a career-best with a five-game winning streak (nine games), between April 15-May 30…Seattle went 8-1 in his starts during this span...Ranked sixth among qualifying AL starters with 9.64 strikeouts per 9.0 innings (95 K in 88.2 IP) before the All-Star break..Completed 6.0 innings or more in five of his 15 starts…worked a season-high 7.0 scoreless frames on April 26 vs. Houston in an 11-1 victory...Fanned six in 2.0 innings of work June 29 vs. Pittsburgh…his total was the most by a Mariners reliever since R.A. Dickey fanned six in 5.2 innings on June 3, 2008…the last Seattle pitcher to strikeout six in 2.0 innings was Rafael Soriano on July 30, 2003 vs. Detroit. The Totals - Went 7-5 with a 3.67 ERA (60 ER, 147.0 IP) and 145 strikeouts in 27 games, 26 starts with Tampa Bay. ... Recognition - Named Tampa Bay's Outstanding Rookie by Tampa Bay Chapter of the BBWAA. ... Leaderboard - Led A.L. rookies with 26 starts, 147 innings and 145 strikeouts…among A.L. rookies (100+ IP), was 3rd in ERA, 2nd in opp avg. (.239). ... Strikeouts - Became fourth Ray to lead A.L. rookies in strikeouts, following Rolando Arrojo (152 in 1998), Scott Kazmir (174 in 2005) and Jake Odorizzi (174 in 2014). ... Strong Finish - Was 6-4 with a 3.36 ERA (46 ER, 123.1 IP) in his final 23 games, including 22 starts after starting the season with a 5.32 ERA (14 ER, 23.2 IP) through his first 4 starts. ... Limiting Damage - Allowed 2 runs or fewer in 19 of his 26 starts, 5th-best in the A.L.…his 19 such starts were a Rays rookie and were 4th most in club history, behind David Price (22 in 2012), Chris Archer (21 in 2015) and James Shields (20 in 2011). ... Nothing To Do With It - His 14 no-decisions tied Los Angeles' Hector Santiago for most in A.L. and set a Rays record…left game in line for win five times but received no decision. ... Not Hits For You - Had 10 starts of 3 hits or fewer, T3rd in Majors and most by A.L. rookie since Cleveland's CC Sabathia (11 in 2001). ... Staying Put - Held opponents to .193 (26x135) average with runners in scoring position, 2nd-lowest average in the A.L. behind Baltimore's Wei-Yin Chen (.170). ... In The Dirt - Had 15 wild pitches, 2nd most in Majors (Los Angeles' Garrett Richards, 17)… most wild pitches by an A.L. rookie since Kansas City's Dan Reichert (18 in 2000). ... The Opener - Made an Opening Day roster for the first time in his career. ... Unbeaten - Went unbeaten (3-0) in 9 games, 8 starts after the All-Star break, while recording a 3.77 ERA…his last loss was July 9 at KC, and last home loss was June 29 vs. CLE. ... Streak - Had 17 consecutive starts of 5.0+ IP May 3-Aug 8, one shy of Rays rookie record. ... Century - Had three starts of 6.0+ innings and 2 or fewer hits in first 15 games, the 5th A.L. pitcher in last 100 years to do so, joining Oakland's John "Blue Moon" Odom (1964-66), Baltimore's Don Hood (1973-75) & Bob Milacki (1988-89) & Cleveland's Cody Anderson (2015). ... 10 - Career-high 10 strikeouts July 4 at Yankee Stadium, making him third visiting rookie with 10+ strikeouts; Tampa Bay's Matt Moore (11, 9/22/11) & Seattle's Roenis Elias (10, 5/1/14). ... Full Service - Hit a home run that accounted for only run of game July 21 at Philadelphia… according to Elias Sports Bureau, became sixth pitcher in A.L. history to do so (last: Baltimore's Mile Pappas, 4/18/62 vs. NYY), and first in DH era…became first pitcher to account for the game's only run with a homer in interleague play, and first pitcher regardless of league since Milwaukee's Yovani Gallardo in 2009…became first rookie pitcher to homer for only run of a 1-0 victory in 136 years-since Harry McCormick for Syracuse Stars in 1879. ... Ranked - Entered season as Tampa Bay's 7th-best prospect, 2nd-best pitching prospect and was recognized as having the Best Curveball in the organization by Baseball America. Acquired from Washington on Feb 13 and spent most of the season with Triple-A Durham before making 2 starts for the Rays in September...Made his Rays debut Sep 12 at TOR and earned his first career victory, 1-0 over J.A. Happ...totaled 7 IP, 2 H, 0 R, 2 BB, 8 SO, becoming the first in franchise history to go 7-plus IP and allow 2 H or fewer in his Rays debut...tied Steve Trachsel (April 3, 2000 at MIN) for the longest scoreless outing in a Rays debut...his 114 pitches were most ever in a Rays debut...Made his second start Sep 21 vs. CWS and allowed 3 HR...has allowed 8 HR in 24 career innings in the majors...After RH Heath Bell was designated for assignment, was recalled for a two-day stint with the Rays from May 3-4 but did not pitch...Made a career-high 30 starts between Durham (regular and postseason) and the Rays...in those 30 starts, allowed 1 ER or fewer 13 times, and allowed 5 ER or more 10 times...Led all Rays minor leaguers with 153 SO and tied Rochester's Alex Meyer (Twins) for most among Triple-A pitchers...ranked 2nd in the International League with 9.47 SO/9 IP, tied for 2nd with 27 starts and 3rd with 62 BB...On Aug 15 vs. Charlotte (White Sox), threw 6 hitless innings with 10 strikeouts before the Durham bullpen lost the no-hit bid in the 9th...despite a no-decision Sep 6 vs. Columbus (Indians), helped Durham clinch a trip to the Governors' Cup finals (7-IP, 1-ER, 12-SO) with a 4-2 win...his 12 SO tied Jeremy Hellickson's Bulls Triple-A postseason record (Sep 9, 2009 vs. Louisville)...His ERA by month for Durham: April 8.20 (26.1-IP, 24-ER)...May 1.39 (32.1-IP, 5-ER)...June 10.55 (21.1-IP, 25-ER)...July 1.62 (33.1-IP, 6-ER)...August 6.19 (32-IP, 22-ER)...named the club's Minor League Pitcher of the Month for May and July...Enters 2015 rated by Baseball America as the No. 7 prospect in the Rays system and the No. 2 pitching prospect behind Alex Colome...the publication also recognized Karns for Best Curveball in the organization. Spent the majority of the season with Double-A Harrisburg (Nationals)…reached the majors and made 3 starts for the Nationals after a late-May call-up, going 0-1 with a 7.50 ERA (12-IP, 10-ER)…allowed 5 HR (3 solo shots)... His major league debut was May 28 vs. BAL…opposing starter was Kevin Gausman, making his second career major league start…allowed 3 runs in 4.1 IP and the Nationals won 9-3... Went 10-6 with a 3.26 ERA (132.2-IP, 48-ER) and 155 strikeouts in 23 starts for Harrisburg…ranked among Nationals minor league leaders in wins (10, tied for 4th), strikeouts (155, 2nd) and ERA (3.26, 4th)... Ranked among Eastern League leaders in ERA(tied for 1st), WHIP (1.18, 3rd), opp avg. (.224, 2nd) and complete games (3, 1st)…ranked 2nd in the league with 155 SO, behind Twins prospect Trevor May (159)... Ranked by ESPN.com's Keith Law as the No. 4 prospect in the Nationals system following the season…Baseball America tabbed him as the organization's No. 9 prospect. Was named Nationals Minor League Pitcher of the Year after going 11-4 with an organizational-best 2.17 ERA in 24 games/18 starts for Potomac of the Single-A Carolina League and Hagerstown of the Single-A South Atlantic League...led the Nationals' system with 148 strikeouts, while the 11 wins tied for 2nd...in 9 starts from June 15-August 2, went 8-0 with an 0.94 ERA...fanned 65 strikeouts and issued just 14 walks in those 9 starts...twice was named Carolina League Pitcher of the Week (June 11-17, July 16-22). Began season in the Nationals Extended Spring Training program in Viera, FL...took the mound for the first time on June 20 pitching for the Nationals' Rookie-level Gulf Coast League entry...combined to go 3-2 with a 2.28 ERA in 13 starts for Auburn of the Short-season Single-A New York Penn League and the GCL Nationals...spun 18.2 scoreless innings of 2-hit ball during 5 starts in the GCL...made Auburn debut on July 19...allowed one run or less in 5 of 8 starts in the NY-P League...allowed only one home run in 55.1 innings on the season. Did not pitch while rehabbing from right shoulder SLAP repair surgery performed by Dr. Wiemi Douoguih at the Washington Hospital Center on July 8. 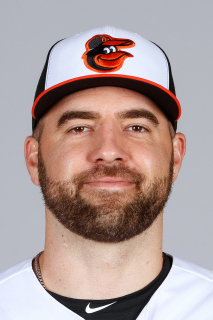 April 20, 2019 Baltimore Orioles sent RHP Nate Karns on a rehab assignment to Norfolk Tides. April 9, 2019 Baltimore Orioles placed RHP Nate Karns on the 10-day injured list. Right forearm strain. February 7, 2019 Baltimore Orioles signed free agent RHP Nate Karns. October 31, 2018 RHP Nate Karns elected free agency. June 2, 2018 Kansas City Royals transferred RHP Nate Karns from the 10-day disabled list to the 60-day disabled list. Right elbow inflammation. March 29, 2018 Kansas City Royals placed RHP Nate Karns on the 10-day disabled list retroactive to March 26, 2018. Right elbow inflammation. November 2, 2017 Kansas City Royals activated RHP Nate Karns from the 60-day disabled list. June 26, 2017 Kansas City Royals transferred RHP Nate Karns from the 10-day disabled list to the 60-day disabled list. Right extensor strain. May 24, 2017 Kansas City Royals placed RHP Nate Karns on the 10-day disabled list. Right extensor strain. January 6, 2017 Seattle Mariners traded RHP Nate Karns to Kansas City Royals for LF Jarrod Dyson. November 3, 2016 Seattle Mariners activated RHP Nathan Karns from the 60-day disabled list. September 1, 2016 Seattle Mariners transferred RHP Nathan Karns from the 15-day disabled list to the 60-day disabled list. Low back strain. July 30, 2016 Seattle Mariners placed RHP Nathan Karns on the 15-day disabled list. Low back strain. November 5, 2015 Seattle Mariners traded 2B Brad Miller, 1B Logan Morrison and RHP Danny Farquhar to Tampa Bay Rays for RHP Nate Karns, LHP C.J. Riefenhauser and CF Boog Powell. September 12, 2014 Tampa Bay Rays recalled RHP Nathan Karns from Durham Bulls. May 6, 2014 Tampa Bay Rays optioned RHP Nate Karns to Durham Bulls. May 4, 2014 Tampa Bay Rays recalled Nate Karns from Durham Bulls. March 13, 2014 Tampa Bay Rays optioned RHP Nate Karns to Durham Bulls. February 13, 2014 Tampa Bay Rays traded C Jose Lobaton, LHP Felipe Rivero and RF Drew Vettleson to Washington Nationals for RHP Nathan Karns. September 30, 2013 Washington Nationals recalled Nathan Karns from Harrisburg Senators. June 12, 2013 Washington Nationals optioned Nathan Karns to Harrisburg Senators. May 28, 2013 Washington Nationals recalled Nathan Karns from Harrisburg Senators. March 14, 2013 Washington Nationals optioned Nathan Karns to Harrisburg Senators. November 20, 2012 Washington Nationals selected the contract of Nathan Karns from Potomac Nationals. September 4, 2012 Nathan Karns roster status changed by Potomac Nationals. August 21, 2012 Potomac Nationals placed RHP Nathan Karns on the 7-day disabled list. June 5, 2012 RHP Nathan Karns assigned to Potomac Nationals from Hagerstown Suns. April 4, 2012 Nathan Karns assigned to Hagerstown Suns from Auburn Doubledays. July 14, 2011 Nathan Karns assigned to Auburn Doubledays from GCL Nationals. September 6, 2010 Nathan Karns roster status changed by GCL Nationals. August 18, 2009 RHP Nathan Karns assigned to GCL Nationals from Washington Nationals. August 17, 2009 Washington Nationals signed RHP Nathan Karns.